How do I update my Blog? Basically I use my iPhone whilst travelling to and from work each day. To edit Posts I am currently using BlogPress. A feature rich app that provides some excellent features and helps me keep the look of the posts consistent. Images can be included easily enough and the app has just enough WYSIWYG features to make life, well easier. Alas, I is currently broken and does not work on iOS 5. This little page was originally simply to see if the WordPress app on the iPhone is easy to use to publish Pages to my blog, as opposed to Posts. Creating this page I can already see two issues, the first is that the lack of WYSIWYG features and the latter is that the edit window has an area where text simply disappears, above the keyboard. That makes the visible area only 7 lines, only 3 when the header text is visible. Entering Pages onto WordPress may require the PC it appears. The NEW version of WordPress for iOS is much improved! 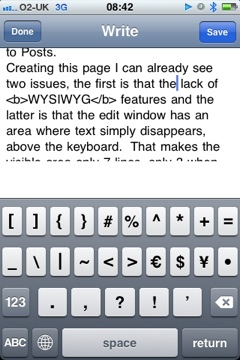 10 lines of text are visible above the keyboard and there are decent HTML options, though not WYSIWYG. You have to use the preview option. The latest way of working for me is on the iPad. I only have the Wifi version o the original but it still does me well. And now I have Hot Spot on the iPhone 4S and Bluetooth keyboard — Whhhhoooosh!